The purpose of Children's Week is to represent Nevada's Children and help stregnthen families in areas such as school readiness, children's physical and mental health, and child safety and security. For the past four legislative sessions, over 80 different non-profit, corporate, philantropic, and state agencies and organizations have joined together as we strengthened Nevada's families by sharing a commitment to improve our communities through events and outreach efforts aimed at promoting the health, safety, and well-being of our children. All events and activities take place in room 3100 of the Legislative building, unless otherwise indicated. Click here to view the Assembly and Senate Committee Schedules. Children's Week would not be possible without support from our amazing sponsors! 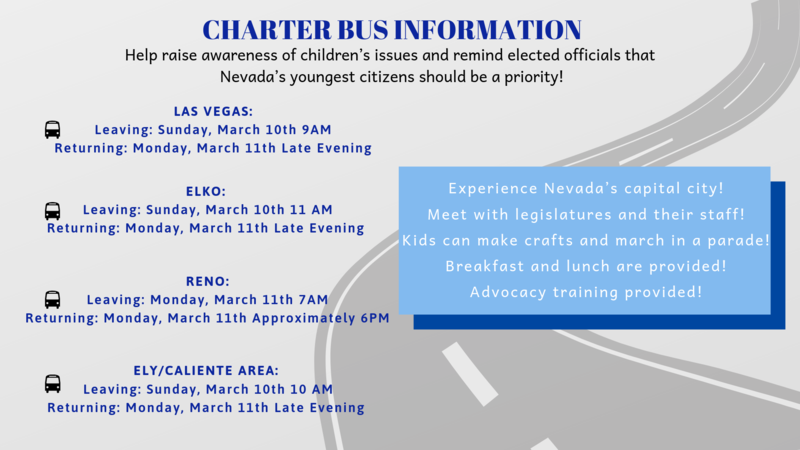 With sponsors' support, we are able to transport families to Carson City, provide breakfast and lunch each day, provide daily advocacy trainings, and organize various activities. Parents, Organizations, and Community Members are welcome to join us at all Children's Week activities! There are several ways to be involved, including volunteering, listing your organization as a co-supporter, tabling, attending events, or helping us spread the word. If you would like to get involved CLICK HERE to fill out our survey and let us know how you will be participating in Children's Week! ALL BUSES ARE CURRENTLY FILLED! Please contact us at nicrp@unlv.edu with any questions. Copyright 2016 NICRP. Original design by Themezy; customized by Leslie Brado. All rights reserved.